Now that you've got a real still, better give some consideration as to how the boiler will be heated. The two most common choices are electric or gas. Like most things in life, each selection has its' own merits and demerits. Electric immersion heaters are readily available for hot water heaters in the U.S. in either 1500 or 3000 watt sizes. But if you want a precise regulating of the heat ( and that degree of control may not be needed) then these heaters will require an additional, and very expensive voltage controller. The U.S. immersion heaters also require a separate 120/240 volt AC source to operate, and they respond very slowly to controls that would regulate the boiler temperatures. They have to be mounted inside the boiler (a messy thing to clean) and the wires run to the outside (a hard thing to seal from leaks). The wiring connections must be enclosed in approved electrical boxes and, to be safe, the work must meet a lot of electrical code specifications. External electric hot plates avoid the internal mounting and wiring problems, but they are very inefficient. They are generally limited in the U.S. to about 1600 watts on a 110 volt alternating current house circuit. That amount of energy may work, given enough time, for small boilers but many find the boil up time excessive for boiler sizes over 5 gallons. On the plus side, electric heating is much better suited for indoor use. It is cleaner, safer (if wired properly), needs no venting, and provides much less risk of alcohol fires or explosions. Bottled LP gas, on the other hand, avoids many of the boiler fabrication, electrical wiring and cleaning problems associated with electric heat. Adjusting the heat level with Gas controls is much more flexible. The heat can easily be adjusted to any setting from off to maximum, unlike the typical Low, Medium, High settings on electrical switches. That is not to say that electrical Potentiometers cannot refine this control, but they cost more than the still. A gas heat source will also react much more quickly to control changes than electric. It's also capable of producing far more heat than electrical household circuits can supply. Gas makes the entire apparatus much more portable. That portability gives you the freedom to move the whole setup out to the garage, barn, utility shed, deck, backyard, or even the deep woods. A small 15,000 BTU cast iron outdoor cooking burner can be bought for about $10.00 in the U.S. (including shipping) that does an excellent job. It will bring 7 ½ gallons of cold (4° C.) water to boil in less than an hour. The burners also come in higher BTU ratings if you are impatient with bringing the batch to boil. The downside is that gas heat, in a confined space and without proper ventilation, will deplete the oxygen in the air. It can also produce dangerous carbon monoxide if the burner is not adjusted properly. It is best used outdoors. Lastly, and perhaps most importantly, the open flames of gas heat are much more likely to start alcohol and combustible fires if great care is not taken. 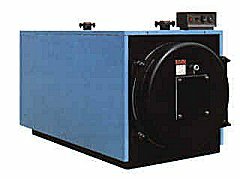 Electric Hot Water Boiler From Bradlee Boilers Ltd.